Samuel Fuller’s last American film, White Dog, was, not surprisingly, a financial failure, and was never given a wide American release. Also not surprising, was the critical success this failure came with. The film is almost perfectly constructed, and is extremely forceful and frank in delivering its underlining cultural themes. This is to the film’s cinematic credit, but also led to its social downfall. Because of some controversial issues raised within the plot of White Dog, many had branded the film as dangerous or even racist, before they had even seen it. This led to some American political groups threatening to boycott the film, if it were to be released. This is, of course, a huge shame, because not only does the film deliver an aggressively anti-racist message, but like many other misunderstood films, it is a cinematic masterpiece. The film follows Julie (Kristy McNichol) a young actress, who accidentally hits a white German Shepherd while driving late one night. She takes in this dog, and develops a strong relationship with it, after it saves her from a violent robbery at her home. Julie slowly starts to realise that this dog, has within it, a dangerous potential for violence. The dog then attacks a young black actress, after Julie takes it with her to an acting audition. Concerned that this dog may have been trained as an attack dog, Julie takes it to an animal trainer. It is here that Julie learns this dog is not just an ordinary attack dog. But, is a dog that has been trained by a racist owner to attack black people. 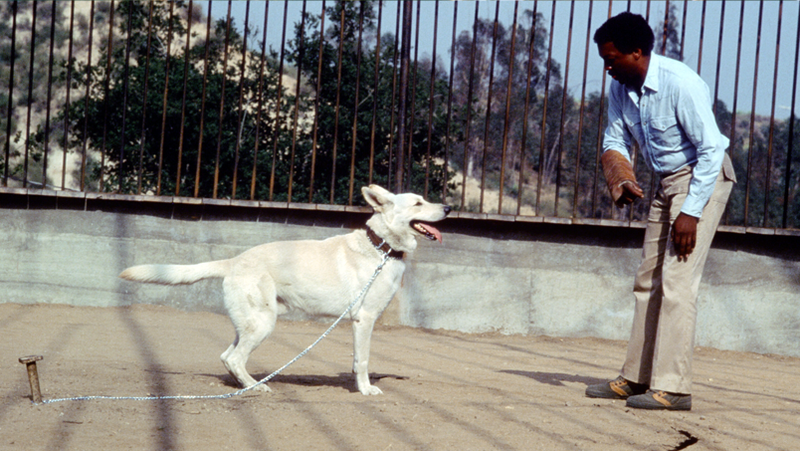 Strong themes start to surface when Keys (Paul Winfield), a black animal trainer, takes this dog into his training programme, and attempts to cure its aggressive behaviour. 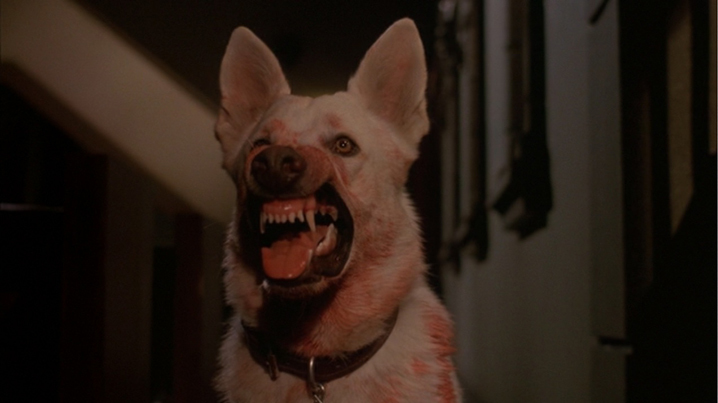 Throughout the film, many suggest that the best thing to do would be to kill this dog, preventing it from attacking another innocent human being. However, Keys absolutely refuses to give up trying, protesting that easy fixes are not the answer. He believes he can break the dog without resorting to destroying it, practising a notion that actively searches for a prevention technique to cure other dogs, rather than killing one, so that another can take its place. The film attempts to view this racist behaviour within a subject that is not a human, allowing us to gain a newfound prospective. This white dog, is a symbol for racism within our society, but is not in a position to know it is acting violent and racist; therefore, can it be cured? Is the racism within our society a disorder that cannot be taken away? Or, is it a learnt injustice that can be worked with and reduced? These are, at its bottom line, the core issues raised within the film. The film also hints at other disorders of the mind, disorders created by past trauma. It attempts, through this dog, to open a discussion on whether these traumas permanently disrupt the brains nerve patterns, or if, with much effort and perseverance, these issues can be safely overcome, without violence. For a film focused mainly on a dog, we receive an extremely thought-provoking portrait of our psychological capriciousness. Although White Dog, in its style, feels somewhat dated at times, the film does establish a clear aesthetic, and well-established mood. The film feels like 80s David Lynch or David Cronenberg thriller/horror films. The action is sometimes strange, but holds much of its energy in kinetic and messy camera work. One scene towards the start of the film sees our main character, Julie, viciously attacked by a criminal. The editing within this scene holds as much excitement as it does danger. We cut between a loud gun battle happening on a TV set, and Julie struggling for her life. This creates as much anxiety and dread as you might need to shift towards the very edge of your seat; White Dog is filled with scenes much like this. Also, note the many great low-angle shots framed within the film, these create a Citizen Kane like establishment of the film’s environment, adding towards its strange, but controllable, eerie tone. The film’s music, by the great Ennio Morricone, also adds an astonishing amount of cinematic depth. Morricone’s score brings to the film a certain post-modern vibe, one that helps lift the film away from any hints of a cheep or forced emotional tone, and towards a clever, well constructed, and moody thriller. This forced mood is also avoided by the few physical stunts performed in the film. Although most of these stunts focus on the many dog doubles the film uses, they still manage to maintain credibility, becoming energy-filled, enigmatic set pieces. For a film so small and personal to just a few characters, its scope in emotional depth and social commentary is nothing but immaculate. As the film’s main emotional leads, McNichol and Winfield create fine characters, at certain moments, feeling very 80s, and partly outdated. However, these doubts never quite fully develop, the two manage to hold a firm and believable technique. 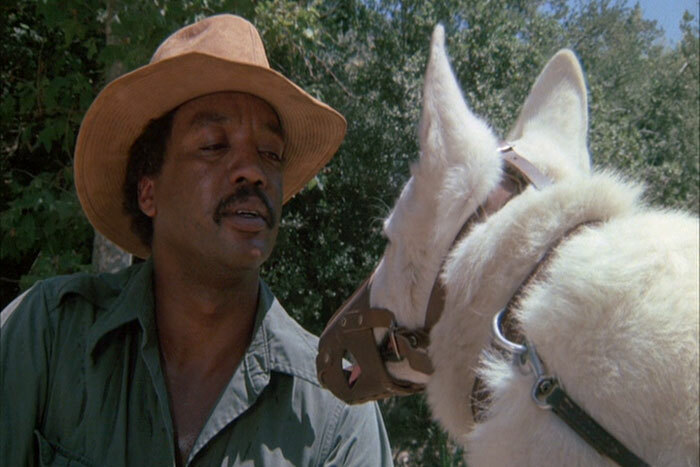 Winfield, in particular, creates many great moments of touching emptiness and despair, adding heart to an otherwise bleak cinematic experience. You can do no wrong by seeking out White Dog; the myths of its highly controversial nature have, already, turned off many potential lovers of the film. You will not only enjoy yourself greatly, but develop shocks, thrills, and be asked to think about an extremely important issue within our society; it is not every day you find a film that can make you feel all of these at once. White Dog is a must-see for any true and passionate lover of cinema. An interesting review Darrell. I have not only never seen this film, I haven’t heard of it either. I will look out for it though, based on your recommendation. Thanks Pete. It’s a great work of art. Are you very familiar with the work of Samuel Fuller? I knew that one day I would find one that even you haven’t yet seen. You are correct, I don’t think she is great. But, for how bizarre the film is anyway, her performance fits somehow. A strange fit, but one that makes a certain amount sense nevertheless, for me anyway. I know a fair bit of his work. I have seen ‘Fixed Bayonets’, ‘Run of The Arrow’, ‘Pickup on South Street’, ‘The Bamboo Curtain’, ‘Merrill’s Marauders’ and ‘Shock Corridor’. I also have ‘The Big Red One’ on DVD. I always thought that he was a good and competent film-maker, rather than a great one. Perhaps my opinion will change after I get to see ‘White Dog’? Best wishes, Pete.